These activities are a great way to get students into groups for certain work within the classroom. 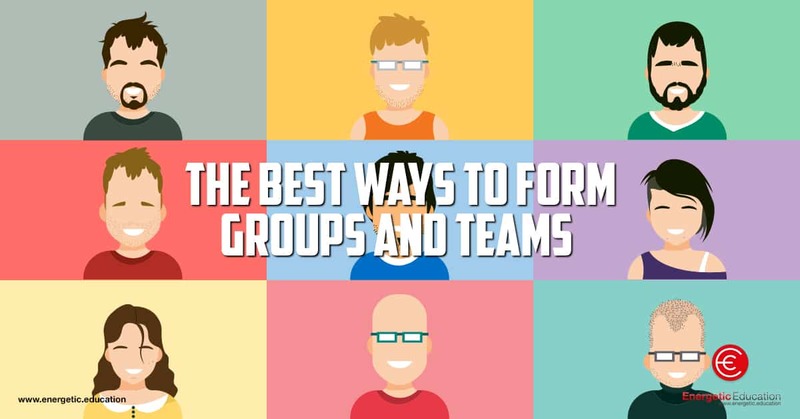 There are a number of different ways to organise groups, instead of using the same method all the time. The students will enjoy the different activities of getting into groups for work. I have found that these activities are a great way to organize groups, but they are also extremely fun exercises to use with your students. The old saying ‘kill two birds with one stone’ applies to these five activities. The students are engaged and enjoying the activities. Plus, once they have finished, students are in random groups ready to start the work you have prepared for that lesson. Using the cards you can choose how many groups you want and how many students in each group. For example, if you want six groups with four students per group, shuffle the numbers 2, 3,4,5,6 and 7 from the deck then hand them out to the class. When you want larger groups, for example, four groups with six students in each, then go through the suits of the deck and keep six cards from club, spades, diamonds and hearts. The card suits will then be your groups. A deck of cards can work perfectly for most situations. Using alphabetical order ask the students to stand in a line up the front of the class. Using their first names they have to arrange themselves from A-Z in the line. Once they are in the line you can pick even groups. If you have 28 students and want groups of 7, then count the first seven in the line and that will be group one. Repeat this down the line. You can also get students to line up in alphabetical order of their surname, their date of birth, from January-December, or their favourite sports teams in alphabetical order. As an extra challenge you can ask the class to organise themselves into these lines in silence. Cut up colour cards, sporting teams’ names, countries’ names, anything you think the class would like. If you want four even groups, cut out four different colours; for example, red, blue, yellow and green. These work great at the start of a term when you are organising table groups or duty groups. You can also use seasons, such as winter, spring, summer and autumn. Find out what your class likes best then use this to motivate them in the classroom. If you want six groups, go around the room and give each student a number between one and six. Then ask all the ones to stand in one corner, all the twos to stand in another area and so on. If you have a class of 25, make five even groups of five by numbering off. This option is very handy when you have little preparation time as you can do it on the spot. In your class if you want to organise pairs, design pairs of animals; for example, cats, dogs, bears, snakes, lions, horses, mice, birds, sharks and so on. Hand out the paired animals to the class members. Once they have the cards they are not allowed to talk. They must make the noise of their animal and find their partner by doing this. This is a great way to form partners and also a fun icebreaker activity that the class will enjoy.